Instead of waiting for 2018 to roll around, Nintendo isn’t holding back any punches concerning Animal Crossing’s foray into the mobile world. Given a deadline of March 2018, tomorrow we’ll get whatever information Nintendo can jam into 15 minutes of a special Nintendo Direct about the well-loved franchise. Until then, let’s speculate what the Animal Crossing app could hold and what might possibly be shown off when the clock strikes 8:00 p.m. PT | 11:00 p.m. ET tomorrow. Since Animal Crossing’s start, you’ve always played the role of a villager. Animal Crossing: New Leaf introduced the added mechanic of acting as the town’s mayor with your assistant Isabelle as your righthand woman. Jumping from Nintendo consoles and handhelds, what could be in store for us on the mobile scene? What if we played the role of a traveler? Having the ability to travel to a new town every day would be amaazing. This would obviously work much better with the unannounced Animal Crossing for Nintendo Switch game by making the towns there available to visit in the mobile app. Daily tasks/quests would be active: helping out villagers, finding a certain fish or bug, completing some task by the standard NPC roster and more. Bells could be earned, special furniture obtained, new fruits discovered, and new things we can’t even fathom right now might be possible. Though… how would we get to the town? Maybe Harvey can set us up with our own little camping van! THAT’S A CUTE NAME FOR A GIRL! OR… UH… A COOL NAME FOR A BOY? Ah yes, the good ol’ questionnaire at the beginning of the game! Maybe it’ll make an appearance this time around or we can jump to the chase and customize our characters à la Miitomo. What if we were given an option of not only designing our human avatars, but also given the ability to pick one of the animal classes in Animal Crossing to serve as our main character? It’s a long shot, but the series already has over 450 animals. 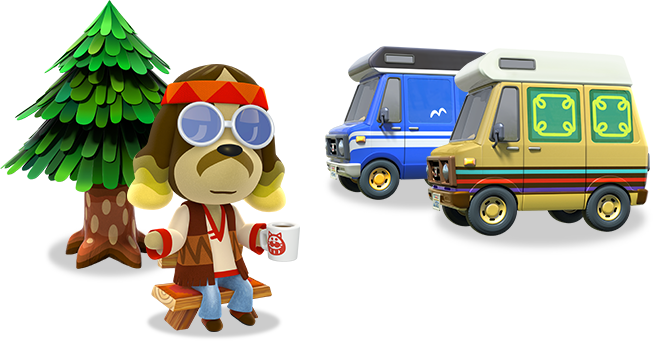 Adding some options here and there, we can become our own animal villager and outfit them in whatever colors, patterns, outfits and accessories we want. Oh, and let’s not forget the customized catchphrase! Even though this could be a smart move for Nintendo, at this time, amiibo compatibility is highly unlikely. Perhaps Nintendo can set up some sort of section within its Nintendo Switch Online app so that cards can be scanned in through the Nintendo Switch and recognized that way. Then again, that seems like more effort than it’s worth. More than likely, if we see any amiibo presence, it’ll be done through buying digital versions through gacha machines and My Nintendo rewards. Even though certain phone models can read RFID chips, there’s no guarantee Nintendo will take advantage of the feature — even though the very prospect of doing so is interesting, given how the piracy market of hard-to-find amiibo has been thriving this past year. It’s more likely that we’ll have to collect bells. Brace yourself for microtransactions. There’s a chance that Animal Crossing’s mobile title will take after Super Mario Run’s payment model. Given Fire Emblem Heroes’ success, it’s looking like we’ll be hiding our PayPal passwords and credit cards. Bells can be obtained by the bag for a fee, and if we’re lucky, we can get a Bell Money Tree. Expect to see holiday and seasonal goods — from outfits, to hairstyles to furniture, to different faces — on the market, tempting you to drop some money for bells. Seeing Nintendo divulge the information for the delayed Animal Crossing app is very much welcomed. This year has been slammed with new releases across all platforms, and seeing Animal Crossing’s app possibly being released by the end of the year is highly exciting, yet somewhat unexpected, celebration. Even though I’ve been a longtime Animal Crossing fan, I’ve got to admit that I wasn’t expecting any information this year, especially with the notion that the app would be tied with its console version game. Here’s hoping that the Nintendo Direct will finally answer a plethora of questions we have, including the date we can circle on our calendars for the app’s release.